Could someone please buy this for me? Omg! So cute!! 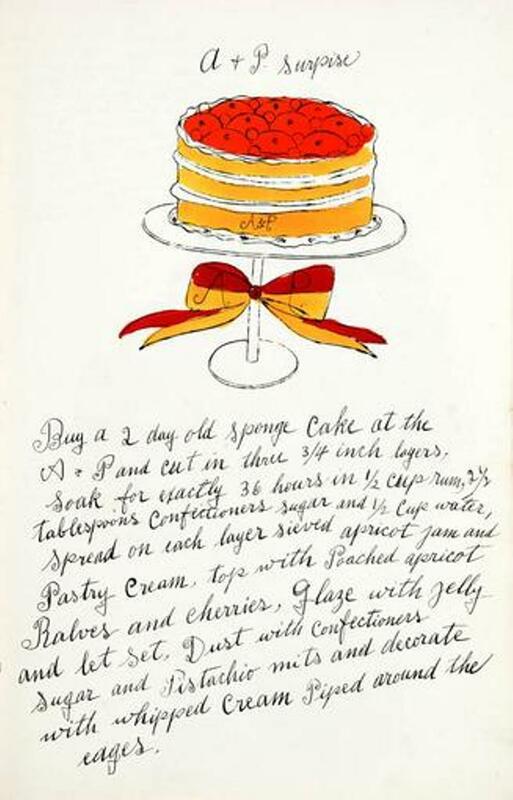 In 1959, Andy Warhol, then a young advertising illustrator, joined creative forces with then socialite Suzie Frankfurt to self-publish a limited edition cookbook titled ‘Wild Raspberries’. Wonderfully satirical recipes were imagined for ‘those who don’t cook’, with titles like – A&P Surprise, Gefilte of Fighting Fish, Seared Roebuck, Baked Hawaii and Piglet a la Trader Vic’s. Warhol’s mother, Julia Warhola, supplied the cursive text, the book hand colored by schoolchildren and said to have been bound by rabbis.